The Great Lakes St. Lawrence Seaway System is a deep draught waterway extending 3,700km (2,340 miles) from the Atlantic Ocean to the head of the Great Lakes, in the heart of North America. The St. Lawrence Seaway portion of the System extends from Montreal to mid-Lake Erie. Ranked as one of the outstanding engineering feats of the twentieth century, the St. Lawrence Seaway includes 13 Canadian and 2 US locks. The Great Lakes and St. Lawrence River have been major North American trade arteries since long before the US or Canada achieved nationhood. Today, this integrated navigation system serves miners, farmers, factory workers and commercial interests from the western prairies to the eastern seaboard. Opened to navigation in 1959, the St. Lawrence Seaway part of the system has moved more than 2.5 billion metric tonnes of cargo in 50 years, with an estimated value of more than $375 billion. Almost 25% of this cargo travels to and from overseas ports, especially Europe, South America, the Middle East, and Africa. From Great Lakes/Seaway ports, a multi-modal transportation network fans out across the continent. More than 40 provincial and interstate highways and nearly 30 rail lines link the 15 major ports of the system and 50 regional ports with consumers, products and industries all over North America. economic — the SLSMC and SLSDC adapt new work practices and procedures and leverage technology to further refine their operations. The end result is a transportation system that moves tonnage cost effectively, reinforcing stakeholders’ economic competitiveness. social — the SLSMC and SLSDC continue to advocate the advantages of moving cargo via the Great Lakes Seaway System, recognizing that marine transportation is the most energy efficient mode, having a very advantageous greenhouse gas footprint. The marine mode of transportation exhibits the best fuel economy of any mode. When compared to transportation by rail and truck, the marine mode can move a tonne of cargo much further on a single litre of fuel. Given the design characteristics of a vessel’s hull, vessels actually operate more efficiently when loaded to capacity. Superior fuel economy also plays a key role in explaining the marine mode’s advantageous performance in terms of greenhouse gas emissions. As we face the challenge of lowering our carbon footprint and reducing the level of greenhouse gases emitted each year, the marine mode provides a unique opportunity thanks to its superior fuel economy. Vessels sailing within the St. Lawrence Seaway and the Great Lakes use a wide variety of fuels. The actual fuel used depends upon the type of engine and auxiliary power units installed in the vessel, and the vessel’s trading pattern. Most vessels, whether oceangoing or dedicated to the lake trade use heavy fuels varying from Intermediate Fuel 60 to Intermediate Fuel 700. The number indicates the viscosity or thickness. Vessels with steam propulsion normally use heavy fuels in the Intermediate Fuel 380 to Intermediate Fuel 700 range in their boilers whereas diesel-propelled ships consume lighter blends between Intermediate Fuel 60 and Intermediate Fuel 320. Marine diesel oil is also consumed by some vessels, and this fuel consists primarily of distillate fuel with a very small quantity of heavy fuel added or gas oil which is pure distillate available in several grades. Heavy fuel supplies bunkered (sold) on the Great Lakes typically has a sulphur content ranging from 1.5% to 2%. In comparison, distillate fuels usually have .005% sulphur content. shipowners are now specifying IMO II/Environmental Protection Agency Tier 2 compliant engines well in advance of the deadline. For vessels that were once powered by steam, engine replacements featuring modern marine diesels combined with the installation of exhaust gas heat recovery devices and shaft driven alternators has, in some cases, reduced the vessels’ nitrogen oxide emissions by 75% or more. Most fleets have engine update programs that will substantially reduce nitrogen oxide and particulate emissions on the Great Lakes when burning traditional fuels. Air quality is an important factor in determining quality of life. The simple fact is that ships move a lot more cargo per unit of horsepower. Even if ships are not quite as clean per unit of horsepower, they burn much less fuel to move a tonne of cargo. When viewed from this perspective, the marine mode once again becomes the transportation mode of choice, as burning less fuel equates to fewer emissions being vented into the air. A single Seaway-sized laker can carry about 25,000 tonnes of cargo. To carry an equivalent amount of cargo, you would need to assemble a fleet of 870 large trucks or 225 rail cars. Moving more cargo via the marine mode provides the opportunity to reduce the amount of congestion on our busy highways and railroads. (National Transportation Statistics Report). These statistics show that moving cargo via the marine mode is the safest means available. Quality of life cannot be defined strictly by the price of goods on a supermarket shelf. It is important to consider what it takes to get the goods to market. These factors include not only energy efficiency, emissions, and safety, but also factors such as spills, noise and congestion that the movement of goods brings about. ‘Spills’ in this context refers to harmful discharges into the environment occurring as a consequence of freight transportation. Within this definition, are included cargo leakages, accidental or deliberate spills, and discharges of materials used in the transportation process — most prominently fuels or lubricants used by vehicles or vessels. Noise from transport is commonly held to be a nuisance, particularly by those living near airports, rail marshalling yards, and highways. Noise is difficult to measure in ways which represent the nuisance that it produces. In the absence of any quantitative evidence, it can only be conjectured how noise nuisance differs among the three freight modes. However, in view of the relative proximity of transport operations to residential areas, as well as the inherent nature of the transportation equipment and engines, it is proposed that trucks impose the greatest noise nuisance per tonne-km while vessels impose the least amount of noise nuisance. Traffic congestion impacts a number of factors, including delays in shipments, increased greenhouse gas emissions, higher air contamination, and increased noise. In the absence of quantified estimates for traffic conditions in the region bordering the Great Lakes and the St. Lawrence Seaway, only conjecture of qualitative rankings is possible. It is clear from the nature of marine traffic that there are few, if any, delays on the water. In terms of rail, some serious congestion occurs around Chicago, the largest US rail hub, and the location of substantial transshipment activity. Considering truck traffic, there is severe congestion during rush hours in all of the major cities, and some cities such as Toronto are experiencing increasing congestion even within the daytime period between rush hour peaks. There’s one word that best describes Federal Marine Terminals: experience. FMT started as a small operation in Chicago in 1965 and in 50 years, has grown into a multi-terminal cargo- handling company with a sterling reputation in North America. Back then, land at 95th Street on the Calumet River was purchased, an old coal dock was resurfaced, sheds were refurbished, forklifts and mobile cranes rented, and in no time, FMT Chicago was born. The company, a division of Fednav Limited headquartered in Montreal, has a sales office in Charlotte, and operates twelve facilities in the US and Canada in the Great Lakes and East and Gulf Coast areas, employing 65 management and administrative employees and 800 to 1,200 longshore employees. 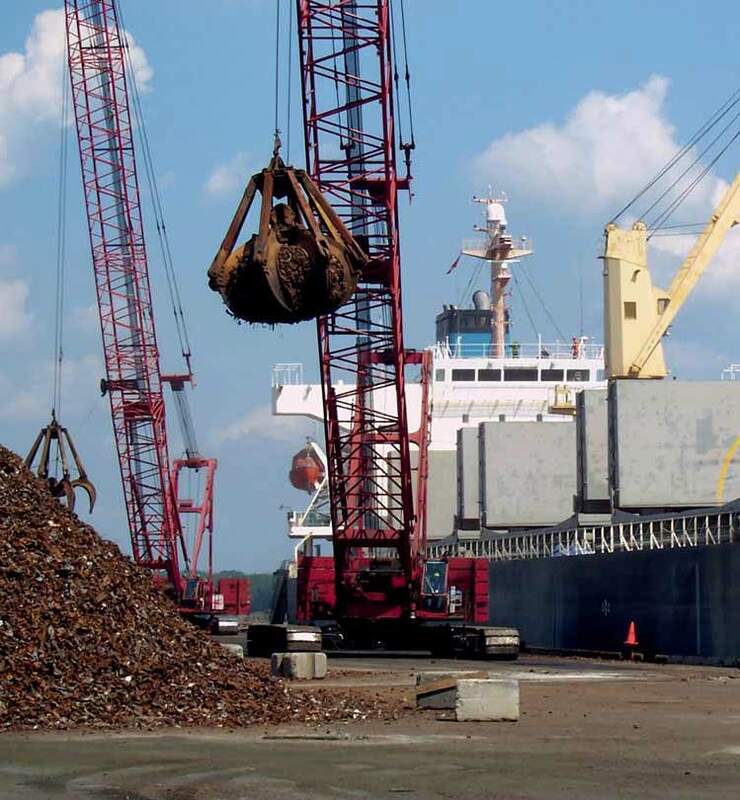 FMT handles various commodities that include general cargo, dry bulk, various steel products, wind components, alloys, forest products, and project cargo. Aside from its 50-year history, several other factors distinguish FMT and have facilitated its growth. Strategic locations of FMT terminals allow for its presence in ports where the Fednav suite — including its shipowning and chartering, liner, and logistic services — do business. FMT offers stevedoring and terminal handling for all types of dry cargo, employing specialized and efficient equipment and proprietary software for cargo and terminal management. A strong management team is supported by a well-trained and safety-oriented labour force that cares for the cargo in its custody. With solid values, award-winning environmental excellence recognition, and a focus on customers, employees, and the community, FMT has lived up to its high standards in reliable, safe, and efficient cargo handling for five decades. The cornerstone of the company’s operations is built on the establishment of long-term relationships with business partners and with its labour force. The guiding principles that have led to the success of FMT are tried and true: concentrating on niche markets, providing consistently excellent service, and maintaining strict safety norms and guidelines. These enduring values are paying off. 2014 proved to be an outstanding year with over 9.3mt (million tonnes) of cargo handled by FMT. Other recent newsworthy mentions include an anniversary trio of celebrations in Cleveland last November for FMT (50 years), FALLine, the company’s liner service (55 years), and Fednav (70 years). Additionally, the Port of Indiana-Burns Harbor recently recorded the highest shipments in its 44-year history where FMT is the port’s terminal operator. Looking forward, FMT will continue to actively seek opportunities for growth, whether by increasing business in current locations or adding new ones, while falling back on its exemplary operating principles, remaining flexible and versatile, and ensuring that its work force stays current with safety and security procedures and technological improvements. Although experience defines Federal Marine Terminals, its mission is to continuously look for new growth opportunities while improving procedures and services. By increasing its presence in North American ports and treating customers like business partners, FMT looks forward to the next 50 years of handling cargo. The Port of Thunder Bay is Canada’s Gateway to the West, built as a crucial transportation link connecting the western provinces of Alberta, Saskatchewan and Manitoba with the world.
? a full-service cruise ship terminal connects tourists to the picturesque port city. The Port of Thunder Bay has entered the 2015 shipping season amidst optimism, buoyed by the strong results of the 2014 shipping season which wrapped up in January. The port recorded its highest cargo volumes in 16 years due to a surge in shipments of western Canadian grain. Thunder Bay’s grain volumes in 2014 were 43% higher than the five-year average. Among the increases in grain shipments, the port shipped its second highest volume of canola on record, and its highest volume of wheat since 1997. The furthest inland port in Canada,Thunder Bay is the Canadian terminus of the Seaway System. The Seaway is the largest inland waterway in the world, and efficiently handles 40mt of cargo annually, with capacity to grow. The marine industry is investing over $7 billion in the future of the Seaway, including major infrastructure upgrades and fleet renewal.